It never ceases to amaze us how creative Japanese designers adapt some of the world's most awkward plots of land. Case in point: with only 52 square meters of triangular space to work with, Mizuishi Architect Atelier still managed to create a beautiful, light-filled, spacious home for a small family in Tokyo. It has a vanilla-colored base and a pitched roof clad in chocolate-colored panels that narrows down to an eye-catching point on one end of the home. Triangular-shaped structures are not uncommon in Japan since space on the island is very limited. 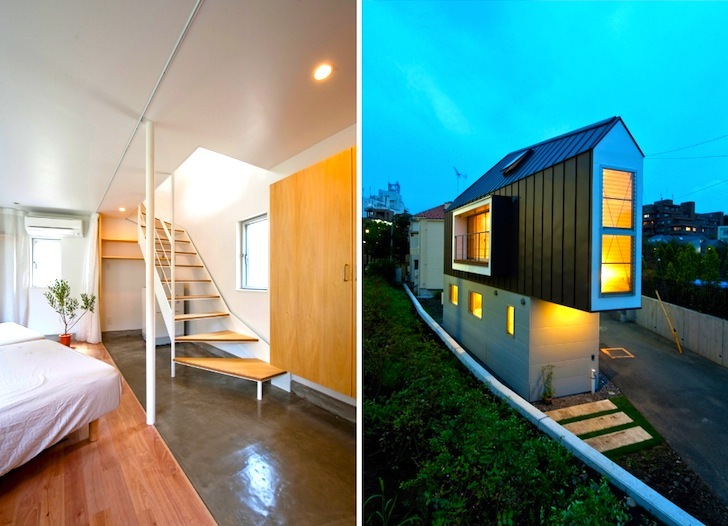 Although they look tiny and restricted on the outside, these homes are often incredibly spacious, and the double story Horinouchi house is no exception. The open plan lower level is reserved for private rooms and the kitchen, while the upper level is used communally. With windows flanking each end of the home and skylights cut out of the angled roof, every inch of the minimalist abode is penetrated with daylight. Space is becoming one of the world’s most coveted commodities, but if we all lived with a little more Japanese efficiency, there would be more to go around! Human ingenuity at its best. This reminds me of the container homes the Japanese built, some of which actually look quite nice. http://liveincontainer.com/10-cool-japanese-container-homes/ It doesn't quite look like your dream home, but it looks pretty cool. Where there is a need, there is a solution! this building really prove that "small is pretty",actually i am quite worried at first because most of the small building are not designed to fit in human scale ,for example like 2 meters ceiling height or 60 centimeters toilet etc. But the space distribution of the building looks weird , entrance > bedroom> stair > living room > kitchen stair > kid's room (sorry that i dont know where's the toilet) the private space is just right after the entrance. If there is a guest visiting today ...?